Karmiel (Israel) (AFP) - In an industrial zone among the hills of Galilee in northern Israel, a ponytailed sociologist with an intolerance for gluten explained what he was up to: beer made with chickpeas and dates. "It's a very Middle Eastern food," 52-year-old Bryan Meadan said of his gluten-free beer made with chickpeas, familiar to most through hummus and falafel. "Local beer with local products." 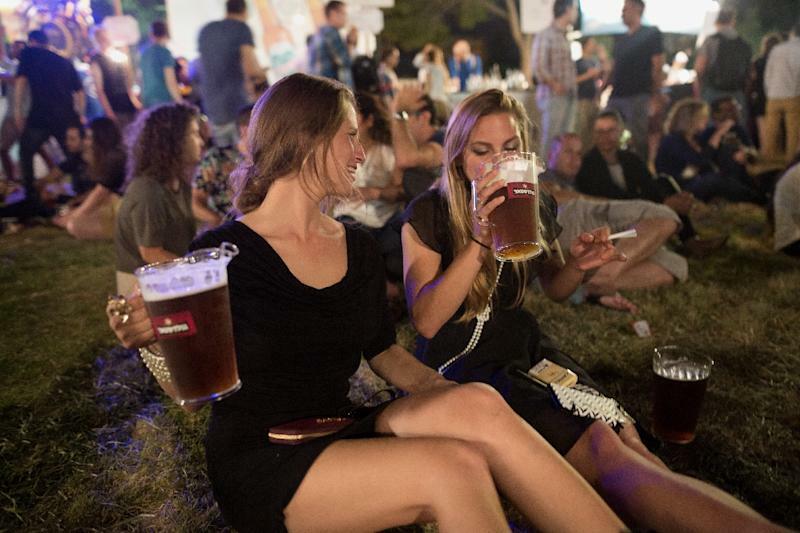 In the part of the world where Jesus is believed to have turned water to wine, enterprising Israelis are opting for beer -- local, craft beer that often has a regional twist. The microbrew movement taking hold in many countries, showing drinkers that a pint can mean more than bland lager, has been embraced in Israel as well. A wide range of local producers now have a firm foothold in the market. Meadan, who pursued his love of brewing by first doing it at home, has a particularly niche operation, producing beer that is both gluten-free and made with chickpeas, dates and buckwheat. Others have pursued a broader audience while emphasising their products' local connection. 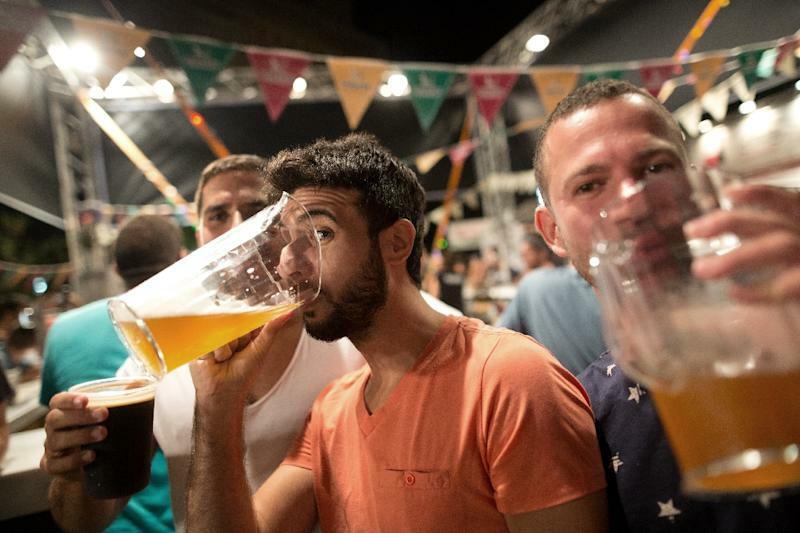 Drinking may not be the first thing that comes to mind when Jerusalem is mentioned, but a recent beer festival in the city drew thousands -- some who came to party and listen to live music, but others to try the craft beers on offer. Microbrew booths handed out tastings in tiny plastic cups, with customers savouring the flavour as connoisseurs would with fine wine. While overseeing his crowded booth at the festival, Ofer Ronen, co-owner of Srigim brewery, said he believed craft beers were growing in popularity because drinkers were beginning to see them as high in quality. "It's unfiltered, unpasteurised, very fresh," said Ronen. "That's why the taste is very powerful." Ronen had been working in a high-tech job before trading bytes for beers four years ago. The numbers support what seems to be obvious when visiting Israel's bars and restaurants, where local craft beers often share menu space with the high-volume Goldstar and Maccabee brews. Craft beer consumption has been on the rise, with microbrews expanding to cover five percent of the market from essentially nothing only several years ago, according to figures from London-based research firm Euromonitor International. As of 2014, there were some 32 craft beer breweries, though six main ones, Euromonitor said. "The leading domestic boutique breweries producing craft beer made waves in the market during the last few years," Lois Berman, head of research at Euromonitor, wrote in response to questions from AFP. "The popularity of these craft beers increased significantly amongst local beer drinkers, driven by taste refinement and national pride." The Palestinians, too, have been producing their own beer. In the West Bank, the Taybeh brewery opened about a decade ago, while locally produced Shepherds beer recently entered the market. In Israel, David Cohen was a microbrew pioneer when he opened Dancing Camel nine years ago. He now operates one of the country's main craft breweries. He also has two of his own pubs in Tel Aviv, one of which is at the brewery itself, with couches set up near copper-clad brewing tanks. Cohen, a former New Yorker and ex-accountant who moved to Israel 12 years ago, produces 20 different beers over the course of the year. One of his ingredients is date honey. Another is juniper berries, which are used in his "Hey Ju-Boy!" beer -- a play on the name he was frequently called while growing up Jewish in the Brooklyn borough of New York City. "It's fantastic," the 52-year-old said of the way the craft beer industry has grown in Israel. "Personally I didn't know when I opened the brewery how gratifying it would be to be sitting in a movement... of craft beer and to actually be able to participate in it and help shape exactly what direction it went in." For Meadan, his small gluten-free brewery in Karmiel is only just getting off the ground. He has chosen a slogan appropriate for beer produced in the Middle East: "Gluten intolerance is the only intolerance we tolerate." Gluten is contained in grains used in other beers, such as wheat and barley. Purists would not classify certain of his brews as beers in the traditional sense, but Meadan said his main goal was to produce a gluten-free product, no matter what you call it. He and others spoke of a spirit of camaraderie in Israel's craft beer community, with new participants helping spread the word and inform the public about the differences between their product and large-scale brews. "It's a really tight community," Meadan said. "When you need something, you have someone to turn to."